Second time staying here. They are always so nice here. And it’s right off the highway so if you’re traveling from Texas to Florida this is the perfect spot! Everything was Fabulous. From check in all the way to check out. Very clean and helpful staff. Breakfast was great and filling. Breakfast was fine. Room was clean. Easy to get back on I-10 east. The staff are friendly and professional. The room was clean and cozy. The location is ok, but not bad. It's in a good area no worries about unwanted guests. The breakfast was good and plentiful and there's always hot coffee. The location is the only "like" I can honestly give. FRIENDLY STAFF. 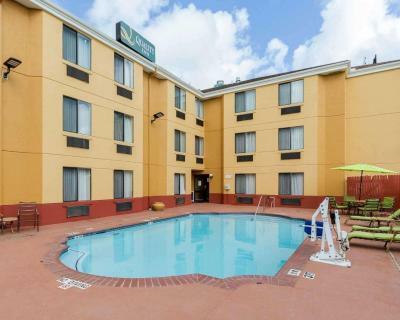 ACCOMMODATING HOTEL EVEN BEFORE CHECK IN TIME..
Quality Inn Baytown This rating is a reflection of how the property compares to the industry standard when it comes to price, facilities and services available. It's based on a self-evaluation by the property. Use this rating to help choose your stay! The Quality Inn hotel is near Houston Raceway Park and the San Jacinto Battleground State Historic Site. You can easily access Port of Houston, Houston Ship Channel and San Jacinto College. Amenities include free wireless high-speed Internet access, free local calls, free parking, outdoor pool and access to fax and copy services. All guest rooms come equipped with microwaves, cable television, irons and ironing boards. Nonsmoking rooms are available. The surrounding area offers many shopping opportunities with dozens of stores at the San Jacinto Mall. Enjoy a nice meal and a refreshing beverage at one of the many local restaurants and cocktail lounges around the surrounding area. When would you like to stay at Quality Inn Baytown? House Rules Quality Inn Baytown takes special requests – add in the next step! Quality Inn Baytown accepts these cards and reserves the right to temporarily hold an amount prior to arrival. The room was not clean nor was the bathroom shower. The front staff were nice. It was run down. Carpet had tears, smelt of smoke and mildew. That they didn’t have their amazing eggs when we stayed but it’s okay the breakfast was as still yummy. The bathroom doesn’t have a door. The WiFi signal is week.